Saturday was the day when we launched my new Property Millionaire Academy and got it off to great start with a launch party too. Starting from 9am the gates were opened at My mansion from 9 am the guests began arriving where they found a transformed mansion ready for the party. 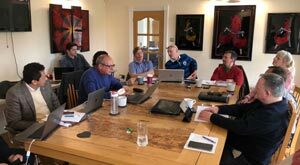 The day was started with coffee and getting everyone talking to one another followed by everyone gathering in the marquee on the lawn ready to share the current the market news, chat about crowdfunding and sharing information on all their deals and experiences in the last month. As Marc Bringmann shared his two deals where he has made £100,000 and then £110,000 on the second one and now is upping his game and doing even better and bigger deals moving into the Commercial to residential Permitted Development. Ian Lawson one of my most successful private clients shared and gave feedback on deals and went on to share how he uses money in reverse and has now been paid three times to buy fantastic luxury properties and create infinite returns as he used none of his own money in any of the deals. As the WARMEST day so far this year moved up to 17 centigrade we felt the room hotting up before we took a fantastic lunch prepared by my super team and some help from a local pub providing a lovely selection of soups to complement the catering. A casual and fun lunch in the mansion and in the garden saw many people exchanging ideas, business cards and advancing their business and sharing successes, challenges and war stories. The final part of the day’s presentations was the launching of the Academy, the new website and a complete rebranding for the Glenn Armstrong brand representing the more dynamic and fun environment property has become and the supporting education, mentorships and private client needs that my team and I provide. Utilising the skill sets of web & brand experts, Rak Design, the new approach now encapsulates a cleaner, modern and more sophisticated look for the Glenn Armstrong brand, pulling together key marketing material including DVD & book sleeves, exhibition banners and stationery. Rakesh and his team went above and beyond to bring to life exactly what I needed and cementing the Glenn Armstrong brand above our competitors. Then Phil Turtle gave us a dynamic demonstration of how to Present like a Pro showing each and every one of us how we can be better in rapport, presentations and meetings. Then it was party time as we finished to take coffee and delicious cupcakes whilst the wine and evening food was prepared. Yes, it was party time. The evening continued with great music, chatting and excitement as everyone mingled and partied and as the wine flowed the tongues loosened, the dancing shoes took to the floor and continues on into the early hours with final leavers at about 3am with one or two last minute stayers crashing out on the sofa. As I went off to bed thinking how only 14 years ago I was starting this incredible property journey, and now how 77 millionaires later (including myself), I put my head down to sleep, thankful that I kept on when it was tough and have helped myself and others to have a life that once was a dream. 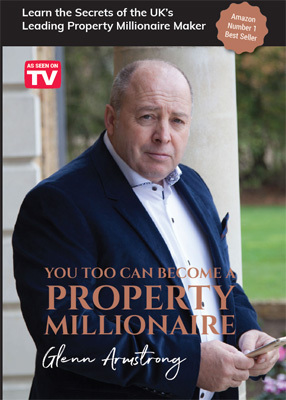 The next 12 years will be even better for those joining us at my Property Millionaire Academy on this fantastic journey. Because as the Robert Browning poems says: “A person’s reach should exceed their grasp, or what is a heaven for”.